Bankruptcy asset sales of used chemical laboratory equipment. Make your bid! Are you looking for used chemical laboratory machinery? You can buy it on Industrial Discount! We organize on a daily basis new judicial auctions, offering the best deals for used chemical laboratory machinery. All items are sold from bankruptcy procedures and company liquidations; this results in a price much lower than what can be obtained for the sale in the normal market. Also, online auctions are safe and transparent: each item is provided with all the relevant information for you to review at any time. If you need any further information, don't hesitate to contact us via the chat service on our website: we will be happy to answer all the questions you may have and will make sure that attending our auctions is a great experience, being risk free for you. If you wish, you can even contact the auction agent, whose details are provided on the auction sheet, and make an appointment with him to inspect the item before making your offer. 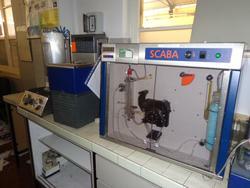 Find now the best used chemical laboratory machinery: make your bid to not miss the deal! Do you want to stay updated about the upcoming auctions of used chemical laboratory equipment? Subscribe to our newsletter! You will receive a weekly email showing new items for sale.